If you’ve decided to join the legions of loyal charcoal grill fans, consider getting a charcoal grill under $500. 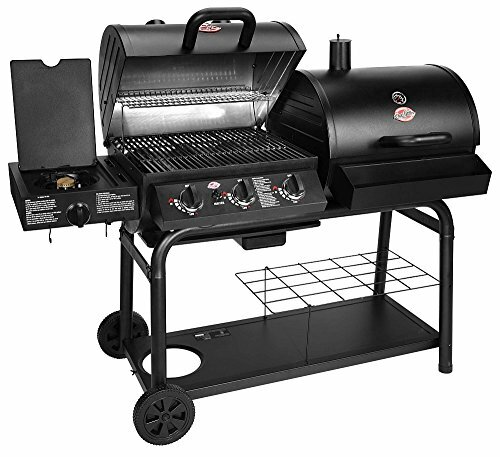 It gives you the most bang for your buck compared to equally-priced gas grills. 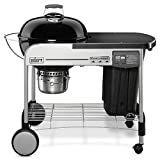 While charcoal grills under $500 are packed with features, they are simple in construction and design and are less prone to mechanical failure. Most grilling enthusiasts agree that no other heat source can infuse your meat with that unique, smoky flavor as hot coals will. The Weber Performer Deluxe hits all the right notes with grilling fans. You’ll love how its electronic Touch-N-Go gas ignition system simplifies charcoal lighting. No more matches or smelly lighter fluid – just push the button and voila! Add this to Weber’s excellence in construction and attentive after-sales service, and I have a clear winner. The hybrid Char-Griller Duo gives you the best of both worlds. Designed to use both gas and charcoal, you can sear your meat on the ultra-hot charcoal side for that complex, unique flavor and use the gas side for warming. Another king of grilling is the Char-Griller 6520 Kamado grill. The energy-efficiency you get from this grill is unmatched. Kamado grills are well insulated and are versatile. Get the Char-Griller 16620 Akorn for the juiciest, slow-cooked meat. It is also the most affordable grill on this list. 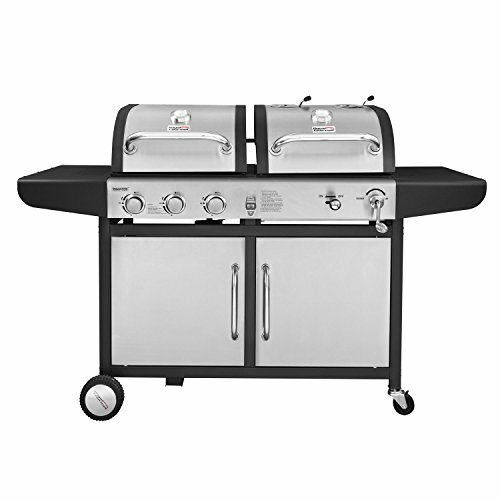 The Royal Gourmet 3-Burner Grill has stainless steel burners with a 25,500 BTU capacity. This grill’s massive 760 square inches of cooking space is only surpassed by that of its hybrid counterpart, the Char-Griller Duo. Kamado style cooking comes from ancient cooking methods that used large clay ovens for insulation. Kamados of recent years are made of heavy ceramics. Char-griller has developed this product for Kamado style cooking using innovative technology to make it more durable, convenient, affordable & Lighter weight than traditional ceramic kamados. 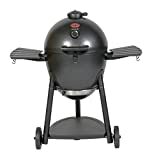 This Kamado Kooker with cart can cook anything from burgers to fish to ribs to pizza. Truly the best food you will ever cook on a grill! Cart features 26" X 26" Of prep/serving space. Easy to assemble. The Royal Gourmet Gas and Charcoal Grill Combo is constructed of a heavy duty material. Elegant design together with the heat resistant firebox brings you superior barbecue experience. 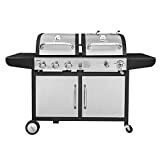 The grill combo comes with 577 square inches porcelain cast iron grates and 165 square inches stainless steel warming rack, delivering sufficient cooking space. 3 stainless steel burners with 27,000 BTU are durable and excellent in performance. The charcoal grill side provides height-adjustable charcoal pan allowing for the easy control of temperature. The side tables on both sides give you plenty of additional working space. Detailed designs such as built-in thermometer and hooks are handy features making your barbecue more convenient. 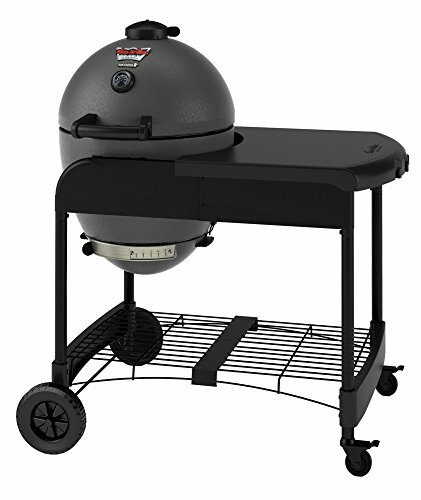 The grill is easy to move around with its casters and wheels, allowing you to enjoy barbecue anywhere freely.